OUTSIDE VOICE is a new feature. It follows musician and writer Glenn Nuotio as he chats with artists, musicians, news-makers and community builders. This new column is published at OttawaMagazine.com. I am, at best, an awkward morning person. 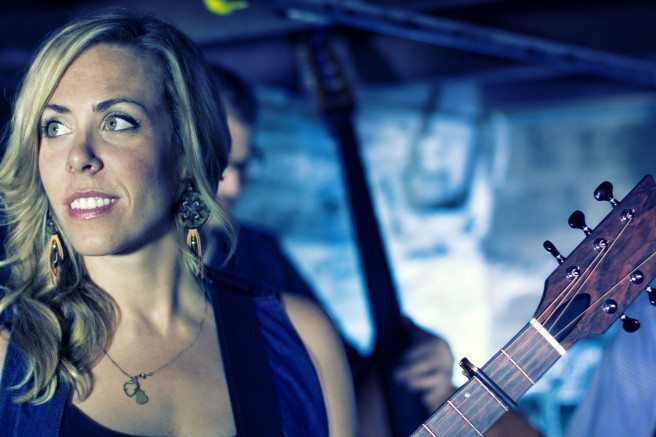 I get my chance to call songwriter and performer Amanda Rheaume at 9:15 a.m. during the week she’s preparing for her Ottawa Bluesfest performance on Friday, July 11th at 6 p.m. on The River Stage. I’m certain this is her first interview of the day, but she does have to take another call at 9:45 a.m.
Amanda Rheaume: I’m awake early a lot, actually. Glenn Nuotio: How many gigs are you doing a year right now? AR: I didn’t count it this year yet, but it’s usually between 150 to 180 or so. It really depends if I have an album and if I’m doing more touring. We talk about her latest album “Keep a Fire” (2013). Amanda details the early co-writing process of songs with John MacDonald, leading her to learn more about her Métis heritage and interpret her personal family history. Listening to the album’s shift of historical and emotional elements, I notice the differences in arrangements between “Keep a Fire” and her last album “Light of Another Day.” Both were produced by Ross Murray. AR: I first met Ross years ago. First of all he’s a fantastic musician, but he’s just so good at kinda getting the best out of me, song-wise, but also vocally. I find that’s he’s just so great … if I bring a song to him, and there’s just voice and guitar, he’s really good at keeping that original essence of the song. His vision is just really good at working with the artist and maintaining the original vision of the music and the songs. He plays drums and percussion and all sorts of other hilarious things on the album as well. It’s just this big, creative, fun time. GN: What was it like to embody the emotional contexts of your ancestors? AR: There was a panic that all of this information would leave once people passed away. It became really important to me to have family stories and Canadian stories. People have said to me ‘ Oh I wouldn’t even bother looking back. There’s nothing interesting.’ You know, you’d be surprised. You just have to ask and you just have to look. I mean, we all come from somewhere and somewhere important. Decisions are made for our life to be this way. I think it’s important to honour that.